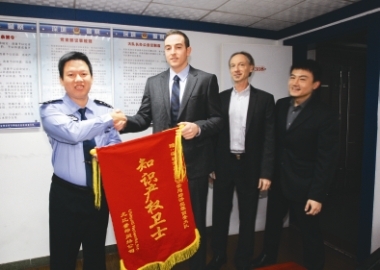 CEO of Ubiquiti Networks in the United States, Robert J. Pera, presents a policeman with a pennant in thanks for the efforts of Bao’an police department in protecting his company’s intellectual property Monday. The company told the police department that one of its dealers in Bao’an was producing and selling pirated routers in the name of the company Nov. 15. Police closed the dealer’s factory and confiscated 1,700 pirated routers Nov. 17.